He’s held the record for 40 years, but former Kentucky All- American Kyle Macy says he never really fretted about freshman Tyler Herro breaking his single season free throw accuracy record. Whatever Herro does, it’s working just like it did for Macy when he always followed his ritual of wiping his hands on his socks before shooting. 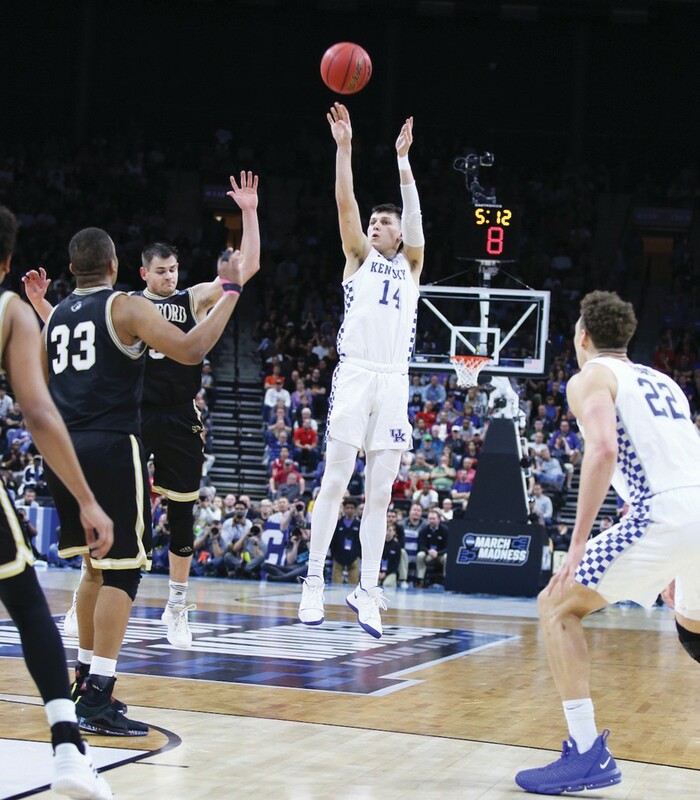 Herro is shooting 94.3 percent (83 of 88) at the foul line and made two in the final seconds of Saturday’s NCAA Tournament win over Wofford to put UK into the Sweet Sixteen. He had tape on his wrist with the number 25 on it to remind him to win for PJ Washington, who was out with a knee injury. Herro has made 66 of his last 67 free throws, including the last 36. Macy holds the single season record at 91.23 percent (104 of 114) from the 1979-80 season. He also made 115 of 129 (89.1 percent) in UK’s 1978 national championship season. Macy is second on the career all-time free throw percentage list at 88.98 percent (331 of 372) behind Jodie Meeks’s 88.99 percent (299 of 336). Travis Ford is third at 88.19 (239 of 271). It’s no fluke that Herro has his name in that elite company. The Kentucky freshman says he often works on his shooting three times a day. Even if anyone told him to consider getting more rest, he wouldn’t. Herro cannot really remember when he couldn’t make free throws. Macy said that’s the only attitude a player can have. Postseason pressure does not change the free throw routine, or accuracy. Herro has been in his best in the most pressurized situations just like Macy always was at the foul line. Macy has not had a chance to meet Herro. The Kentucky freshman said he was not really sure who Macy even was until recently even though he was on the verge of breaking Macy’s record. John Calipari went to a friend for strategy help last summer. The friend — Belmont coach Rick Byrd. ”I went up and was in his house this summer because I wanted him to tell me some five-out stuff, some back-door stuff, some shooting — because I thought we had a skilled team and I wanted to learn some different stuff, and we ended up spending an afternoon together with he and his assistant,” Calipari said. Byrd got his team into the NCAA Tournament again this year and has over 800 wins in his coaching career. Byrd said as many as 10 coaches from different levels have come to pick his brain in the last seven or eight years. Count former Kentucky point guard Roger Harden as a believer in Calipari. “I will never worry with Cal about us having enough ability to win a national championship,” Harden, who played for Joe Hall and Eddie Sutton, said. “I think we have probably had the talent every year but one that he has been here. Harden says when he played 30 years ago, players didn’t face the pressure to produce immediately and show they were a “world-class recruit” like players do now. Harden says it’s none of his business how Calipari recruits, either. “He’s always delivered. There are some consequences with the fan base with one and done players, but he wins. That’s what matters,” Harden said. “Fans were connecting with players back in my time in the way players don’t connect with fans now. That’s just being honest. That’s not anti-Cal or anti-UK. That’s just a fan from the past pointing out how things have changed but Cal makes it work. Every NFL team sent front office personnel and/or scouts, including Oakland general manager Mike Mayock and Minnesota head coach Mike Zimmer, to Kentucky’s Pro Day last week to watch 13 players on last year’s 10-3 team work out. No one may have helped himself more than cornerback Chris Westry, who was not invited to the NFL combine. He had the fastest 40-yard dash time of 4.31 seconds and his 38-inch vertical jump was also the day’s best. “I just want to show what I can do at the next level,” Westry said. Offensive lineman George Asafo Adjei also put up some impressive numbers. He was measured at 6-4 7/8 and 306 pounds. He ran the 40-yard dash in 4.9 seconds, had a 30-inch vertical and did 31 reps on the 225-pound bench press. 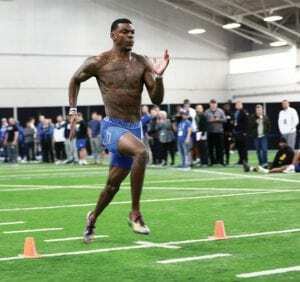 “When you have a guy with that size who can run that time, the NFL teams are going to notice,” former UK running back Anthony White said. Cornerback Lonnie Johnson ran a 4.39 40 and weighed in at 210 pounds on his 6-2 frame. That was much better than the 4.52 he turned in at the NFL Combine in Indianapolis. He’s now being listed as a second round pick in most mock drafts but at least eight teams have shown significant interest in him during interviews. Kentucky tight end C.J. Conrad didn’t get to participate in the NFL combine after tests revealed concerns about his heart. He’s now been cleared and participated in pass catching drills only at UK’s Pro Day. However, he will have his own workout for NFL scouts next week at Kentucky. Abbey Cheek never let pursuing the all-time home run record at Kentucky become a distraction for her before she finally hit the record-breaking homer last week against Missouri. Cheek hit her 49th career home run Saturday to break the school record set in 2012 by Brittany Cervantes, who is now a graduate assistant coach at UK, and then blasted her 50th on Sunday. She now has both the home run and RBI career records at UK. “I just kept focused on what my job is and that is to drive in runs,” Cheek, a senior third baseman, said. “Buying into the process and just stating within myself and knowing the big hits will come as all I tried to do. Cheek had met Cervantes, a former professional player, during UK alumni weekends. Kentucky got swept at home by Missouri last weekend after getting off to a 6-0 start in SEC play. However, Cheek remains optimistic about what lies ahead for her team. “I think that we have a lot of chemistry and potential to go really far this year. We are just going to keep working on the little things that we can control and then good things will happen for us. Quote of the Week: “I don’t really see it as pressure. I played in some pretty big games throughout any whole life. McDonald’s game was pretty big, state championships. NCAA Tournament doesn’t compare like a state championship, but I’ve been preparing for this my whole life, and it’s been a great time being a part of this,” Kentucky freshman Immanuel Quickley on playing in his first NCAA Tournament. Quote of the Week 2: “I was intrigued by the way people talked bout him. He’s one of the most exciting players in college basketball. He has great court vision. He’s somebody that’s fun to root for and he is going to make some NBA really happy. It’s made me realize that basketball recruiting can still be wrong about some real stars,” Bleacher Report writer Mirin Fader on Murray State point guard Ja Morant, who had a tripledouble in the NCAA Tournament last week. Quote of the Week 3: “It’s a dream come true because you always want to play against higher-ranked schools, and this is up there. Kentucky is a great team, great program, great players and great coaching staff. I used to grow up watching them and just being out there — not being out there, but just watching them and dreaming about going to Kentucky. This is truly a dream come true,” Abilene Christian’s Jaylen Franklin on getting to play UK in the NCAA Tournament.